Samson Kpenosen opened his goalscoring account for the new season as Dong Thap Cao Lanh defeated Hoang Anh Gia Lai 2-1 in the V-League on Sunday afternoon. The former Warri Wolves star fired blanks in his first two matches in the top-flight, against Da Nang and Ha Noi ,before netting his first of the season at the Cao Lanh Stadium. The visitors equalized in the 17th minute before Kpenosen scored what turned out to be the game-winner in the first minute of first-half stoppage time. The 24-year-old accumulated 225 minutes of game time before netting his first competitive goal of 2016. 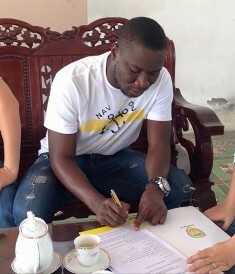 Kpenosen signed a one-year contract extension with Dong Thap Cao Lanh two months ago.